culture – the invaluable mosaics and frescos of the “Russian metropolitanate.” The authoress has raised a task to present an integral sacral and artistic image of the monument, to reconstruct objectively its history. She introduces a whole series of new facts in the science. The reader will get to know that St. Sophia Cathedral, built by the princely couple of the baptizers of Rus, Volodymyr the Great and Anna the Porphyrogenita, and completed by Yaroslav the Wise, appeared in 1011–1018. 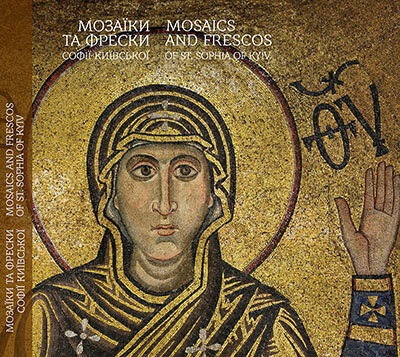 The mosaics and frescos, which glorify Volodymyr and Anna as the baptizers of Rus and architects of St. Sophia, contain a portrait of their family and tell of the conclusion of a dynastic union of Rus and Byzantium in the late 10th c., which initiated the baptism of the Kievan state. The authoress acquaints the reader with the brilliant and mysterious age of Byzantium and Kievan Rus, with the unknown pages of life of their powerful rulers. The mosaics and frescos of St. Sophia appear as the nation-wide shrines and unique historical sources distinguished by their antiquity, authenticity, profound spirituality, artistic wealth and miraculous diversity of realistic and symbolic content. The richly illustrated book combines the scientific character and simplicity of presenting the material and is intended for all those who are interested in the history and culture of the Kievan Rus and Byzantium. ← Лильо І. М. Греки на території Руського воєводства у XV-XVIII ст. : монографія / Ігор Миколайович Лильо. Львів: ЛНУ ім. І. Франка. 384 с.